Until recently, virtually every trapping system designed for analyzing air in stainless steel canisters via TO15 have used packed traps to concentrate the sample while removing unwanted air, CO2, and water vapor. Packed traps have a high trapping capacity, and the use of multiple beds of adsorbents of increasing strength has allowed a wider boiling point range of compounds to be recovered. However, it has long been known that preconcentration onto packed traps has never been able to approach the reproducibility of loop injection, which can show precision of +-1-2% RSDs. Precision generally ranges from 4-10% using packed traps when the sample or standard remains unchanged, but can increase to a much wider error range when moisture levels or preconcentration volumes vary in the sample, which they often do when analyzing air samples or while generating calibration curves. Entech has identified the reasons for these inconsistencies when using packed traps. Since adsorbents, like all other solids, expand and contract upon heating and cooling, the adsorbent is expected to shrink during cooling in preparation for the next sample to be analyzed. As an adsorbent cools, frictional forces between the adsorbent particles tend to create “channels” through the adsorbent. These channels are low impedance flow paths where resistance to flow decreases by the 4th power of the distance between particles. That is, if even a very small gap were to form that is only twice the distance normally found between particles, the flow increase through this small gap would be 16 times greater than the flow passing through the more densely packed adsorbent. This in turn allows a much greater extent of chemical penetration into the trap. It is also expected that there will be slight differences with each cooling in the way that a trap will create these channels, resulting in inconsistencies in the recovery efficiency of the trap. Upon thermal desorption, these channels will close back up as the traps are heated, further reducing the potential for recovery of compounds that have traveled further into the trap. Open Tubular Capillary Columns, whether WCOT or PLOT columns, have a coating on the internal surface that is just a fraction of the total inner diameter of the column. A WCOT column may have 0.1-7um on the walls, which is not much compared to their 100um to 530um inner diameters. Even PLOT columns have normally just 10-20um layer of particles, which still leaves most of the inside of the column empty. When these columns heat and cool, there is almost no difference in percentage of open internal diameter, so channeling becomes an impossibility. This means that used as traps, capillary columns are much more likely to provide a totally reproducible solution that will provide far better precision than packed columns. 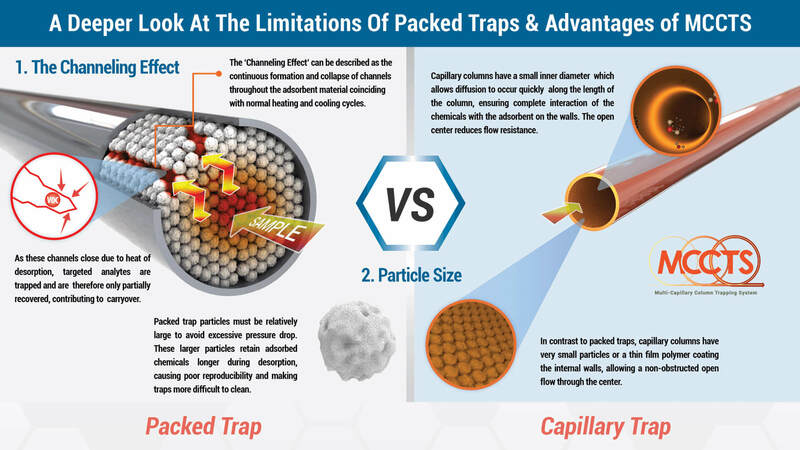 A second problem with pack traps comes from the size of the adsorbent particles that are used. Packed columns and packed traps usually have particles sizes that are at least 10 times larger than those found on the inner surface of a capillary column. The use of smaller particles smaller than about 100 mesh in packed traps makes the pressure drop too great, making their use impractical. if these particles were thought of as spheres to a first approximation, a 10x difference in diameter means a 1000x difference in volume, as volume varies by the cube of the radius of a sphere. This huge difference in particle volume is extremely important when evaluating release rates of chemicals trapped within these particles, which directly relates to faster injection rates and better chromatography when back-desorbing into a capillary GC system. Adsorbent particles with 1000x less volume will also clean up much faster when exposed to very high concentration samples. This has a big advantage with soil gas analysis, as the accidental analysis of high concentration samples can cause packed traps to become so contaminated that they can take days to clean up, whereas capillary traps show cleanup rates that are 10-100x faster, often allowing acceptable blanks directly following a sample that is 100x over the high point on the curve. Water management is substantially improved used capillary columns with smaller particles, as the ability to dry purge out water is dependent on how fast water molecules can find their way out of the inside of the adsorbent particles. 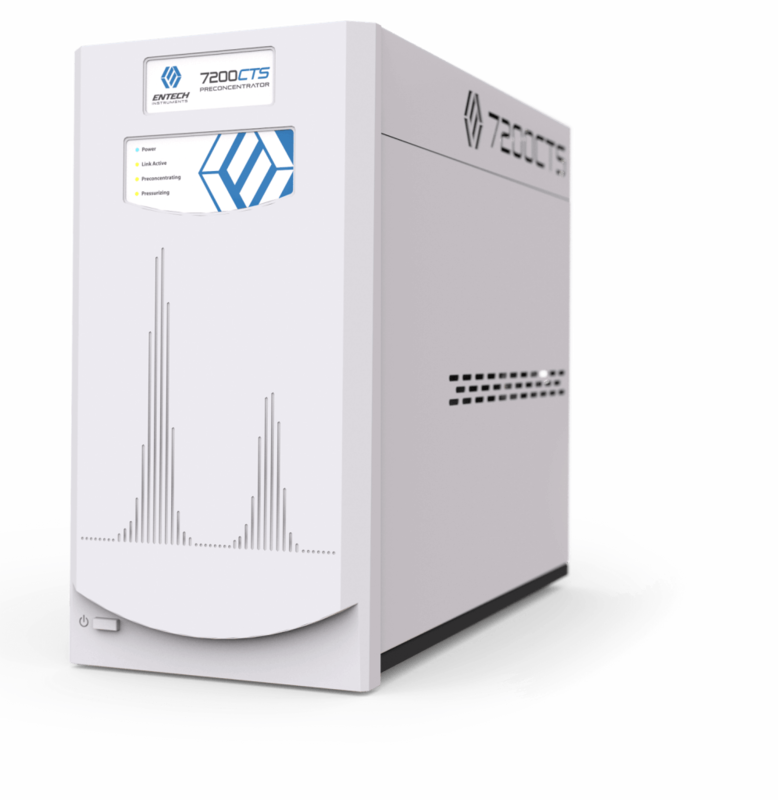 An air sample that is at 50% Relative Humidity at 25 deg C contains 1.5% water vapor, which stated in terms relative to VOC analyte levels is 15 million PPBv water vapor. 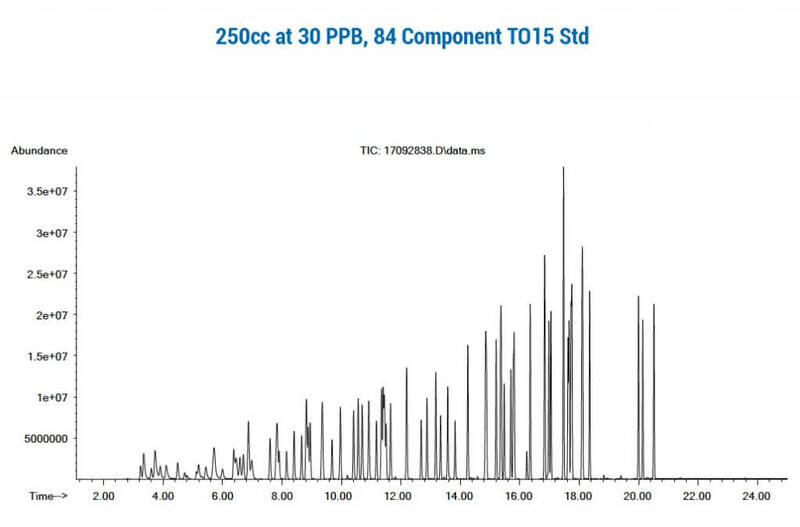 Packed traps with their larger particles have a problem releasing more than 97% of the water during dry purging, which still leaves 500,000 PPB of water (0.5 million PPB), which creates a substantial challenge for the GCMS. Due to the far faster equilibration of water molecules when using particles that have 1000x less volume, water can be released to >99.999%, literally leaving a water peak in the run that is 10-20PPB, which will never cause interferences in the MS, or cause excess column damage to the capillary column in the GC. 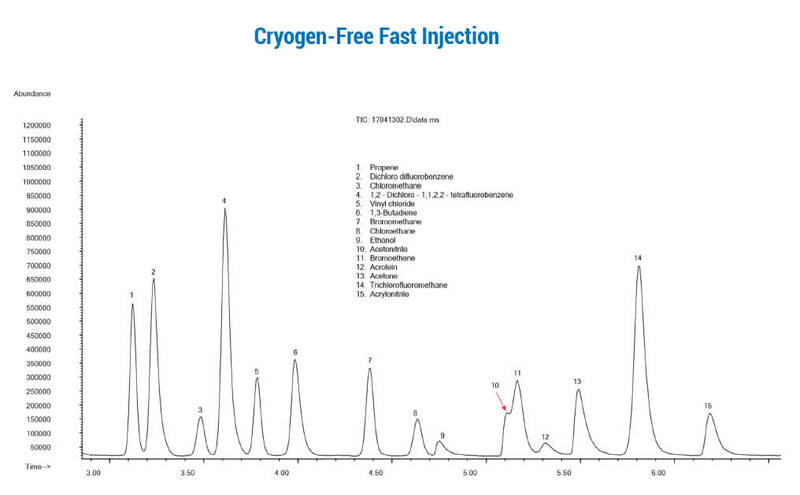 Even with injections every 20 minutes, a GCMS response will not drop down during the course of the day, as water has been completely removed by the capillary traps prior to sample injection. Capillary columns do not have the capacity of packed columns, but when doing a splitless injection onto a capillary based GC which most TO15 systems do, capacity isn’t the issue, because a packed trap fully loaded would overload a capillary column by 50-100 times. The issue is whether capillary columns can retain all compounds of interest, while trapping a volume large enough to reach required detection limits. Using a series of capillary columns of increasing strength, all of the advantages listed above are realized (faster and more complete release, faster cleanup, far better water management) while retaining all compounds of interest. If further reduction of volume is needed before injection, the primary capillary column trap can be backflushed with a smaller volume into a second capillary column focusing trap, so that a very fast injection can be performed into the GC or GCMS for optimum peak shape without the use of any liquid nitrogen. The figures below show 250cc of an 84 compound gas standard at 10 PPB that was trapped on a 3-stage primary trap with 3 capillary columns of increasing strength, then backflused onto a second multi-column trap with shorter column lengths, and then finally backflushed onto a capillary GCMS system. Pre-heating of the second “focusing” trap prior to GC injection allows “near liquid nitrogen focusing trap” injection rates, while again providing much better water management than dry purged packed traps or “Cold Trap Dehydration” have been able to demonstrate. Preconcentration systems using Multi-Capillary Column Traps have a tremendous advantage for the TO15 laboratory, as productivity and costs savings can be substantial, with significantly less downtime when accidently analyzing high concentration samples which is probably the number one cause of system downtime in todays TO15 laboratories. Maximizing uptime and productivity can make the difference of being competitive or not in today’s and tomorrow’s TO15 market. Entech is proud to release the world’s first multi-capillary column trapping system (MCCTS) patent pending, for the precise concentration of vapor phased volatile chemicals in the range of C3 to C18 without the need for liquid nitrogen or complicated electronic cooling. With over 28 years of continuous improvements and industry feedback, the 7200CTS is as established and reliable as it is new and improved.